A fresh blueprint has been unveiled for Liverpool John Moores University’s £64m plans to redevelop the site of the old Royal Mail sorting office on Copperas Hill. Proposals for two buildings accommodating sports facilities and a ‘student life’ area have been drafted after the original £100m development on the site, which included rooftop football pitches, was scrapped due to rising costs in 2016. 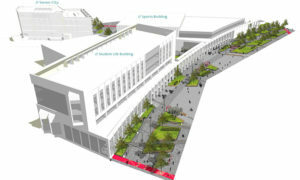 Work will be led by the Faithful+Gould consultants, with the new scheme offering a gateway beside Lime Street, as well as linking the Mount Pleasant and Byrom Street campuses more closely. An eight-court sports hall and a gymnasium form part of the designs, with this spelling a probable end of operations at the IM Marsh campus in Mossley Hill, which LJMU will look to vacate in 2020. A drop-in session was held on Thursday for people to view and comment on the outline vision, before final proposals will be drawn together for a formal planning application to Liverpool City Council. Mark Askam, Associate Director of the Estates department at LJMU, told JMU Journalism: “I invested a lot of time into the previous scheme and was very disappointed that we weren’t able to deliver it. “It has given us an opportunity to bring forward the site in a different way. It’s a more connected scheme and I’m really looking forward to it. “It will provide study and social space on campus, something we previously haven’t been able to. Also, [there will be] sports facilities, which we’ve not been able to provide in the city centre in a meaningful way. That was the plan for the initial scheme. We called it ‘the heart’. Professor Nigel Weatherill, the LJMU Vice-Chancellor said: “Copperas Hill is an area with significant potential for the university to create open pathways and public realm which will connect our two existing campuses. 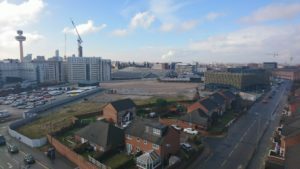 “We have taken time to develop the plans for the regeneration of Copperas Hill and we do believe we have now arrived at the right approach. LJMU hopes to move in to the new buildings, if plans are approved, by 2020.